This is a very rare survivor - you often more readily find commemoratives for later international exhibitions held in Glasgow - more specifically the 1938 Empire Exhibition. This was one of the first international exhibitions to have been staged in Kelvingrove Park in Glasgow between May and Nov. 1888. The aim of the exhibition was to draw international attention to Glasgow's achievements in applied sciences, industry and the arts. It was also hoped that the Exhibition would raise enough money to a Museum, Art Gallery and School of Art in the city. Indeed, it was the greatest exhibition to he held outside London and the largest ever in Scotland in the 19th century. 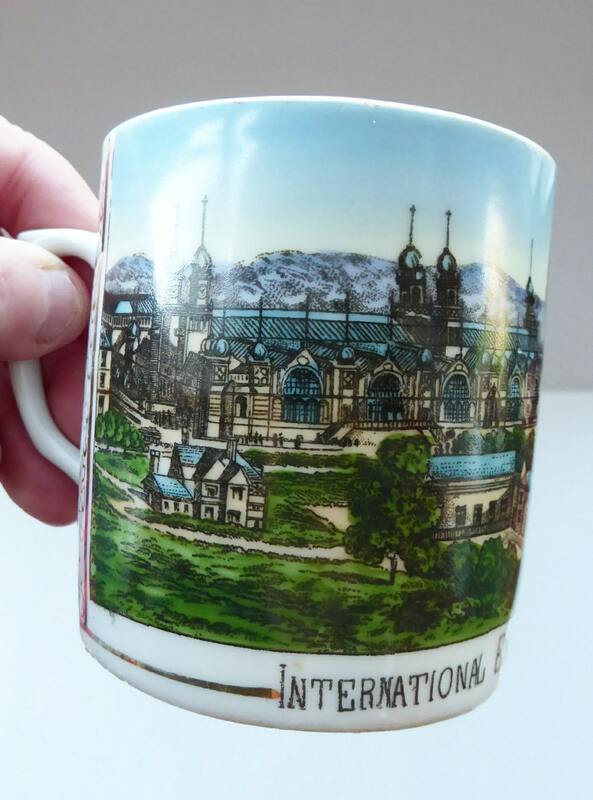 My rare souvenir mug shows the main building, with its 170 ft high dome in the centre. In the foreground is the River Kelvin which was made deeper and cleaned for the exhibition. 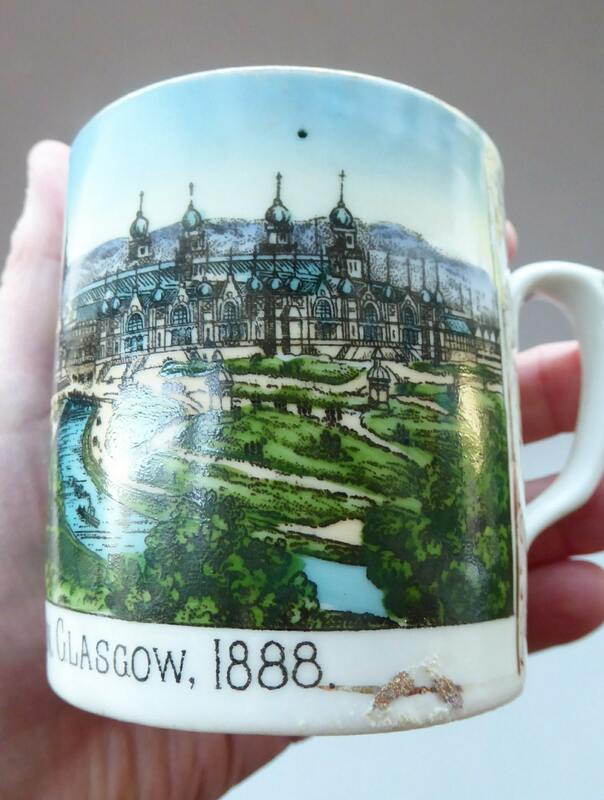 Visitors to the site could take trips on the river (my mug shows a little steamboat) and there was even a gondola imported to Glasgow from Venice. The money raised from this exhibition indeed went towards the building of Kelvingrove Museum and Art Gallery. Further exhibitions took place on the site in 1901 and 1911. 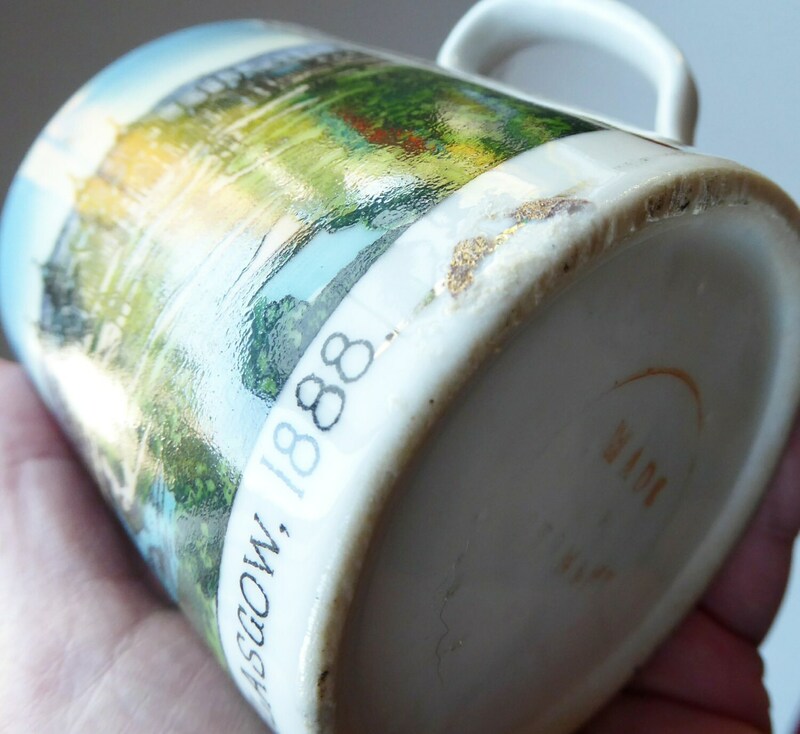 As mentioned souvenir items from the 1888 exhibition are now very hard to find - and many are in either museum collections or private collection. My mug - is certainly a very attractive one - and I think made in Germany - as there is an almost illegible stamp on the background which I think reads: Made in Germany (where many Victorian souvenirs were originally made). It is in very good condition - the image is printed nearly all around the mug. There is a ring of gold gilt inside (some slight rubbing but really just commensurate with age). The handle is without damages or restoration. No staining inside either. 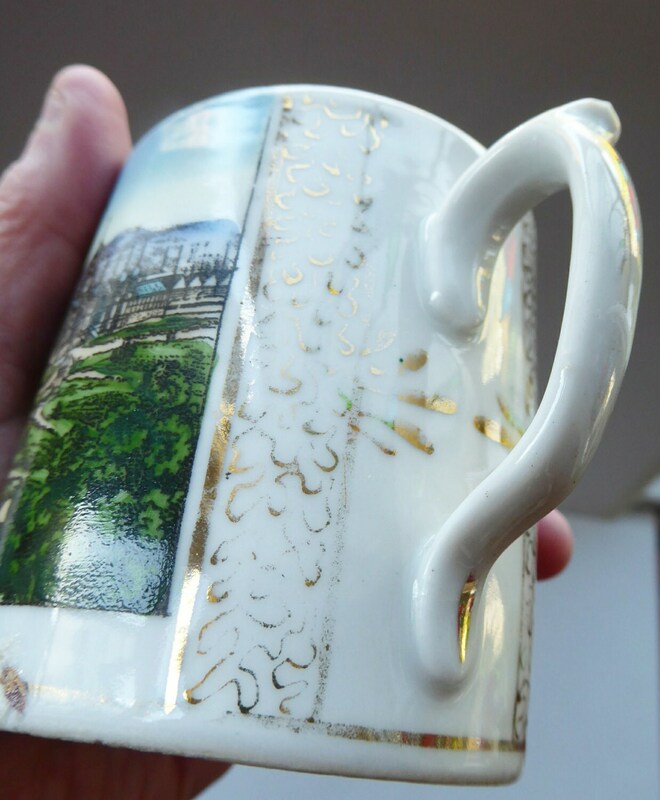 The only flaw with my mug has occurred in the making: where he seems a finger with some gold gilt on it has smugged a wee bit of the clear glaze just after the 1888 lettering. This is shown in my photos - it is not damage but done in the manufacture. Dimensions: height just over 3 inches. With a diameter of 3 inches at the widest point. 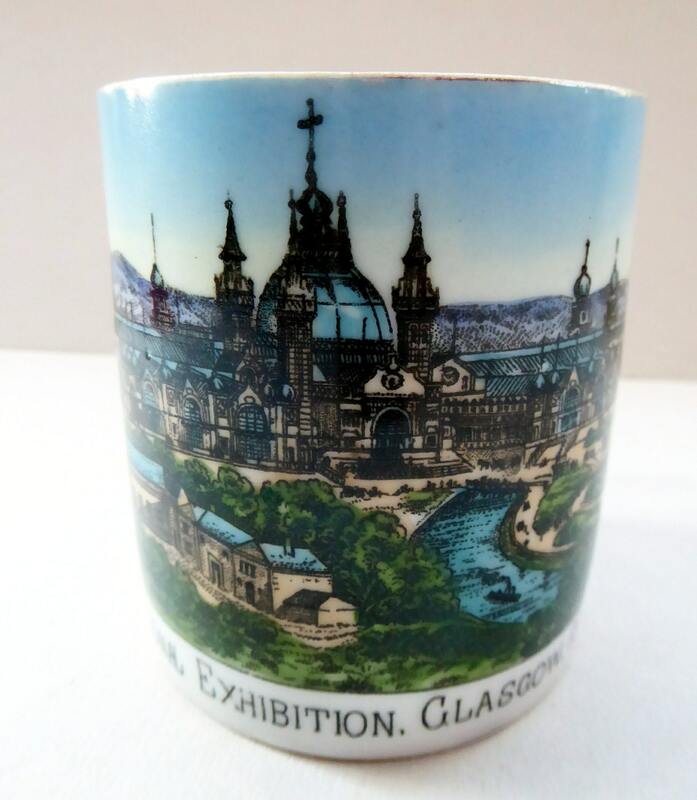 Very collectable cup - perhaps one which should be in Kelvingrove Museum collection - but certainly you will have to look quite hard to find another. Fair price for this antique mug.